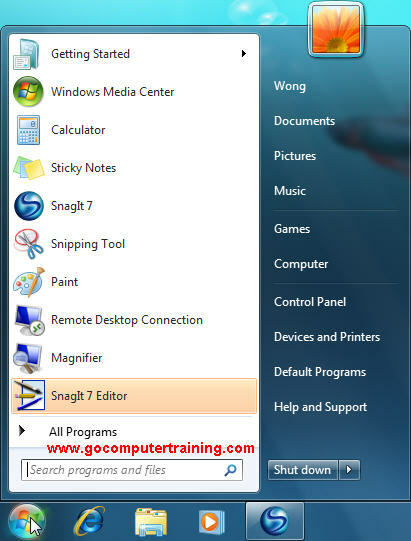 The Windows 7 Start menu provides the starting point for almost all the applications. Just click on the Start button and you will see the Start menu. The Start menu is divided into two columns left and right, allow you to open/start a program, open a document, change a Windows setting, find a file, display support information, and so on. The left column of the Start menu is separated into two lists: pinned items above the separator line and most frequently used items below. The pinned items remain on the Start menu while the most frequently used items change as you use programs. Windows 7 keeps track of which programs you use and displays them on the Start menu for easy access. 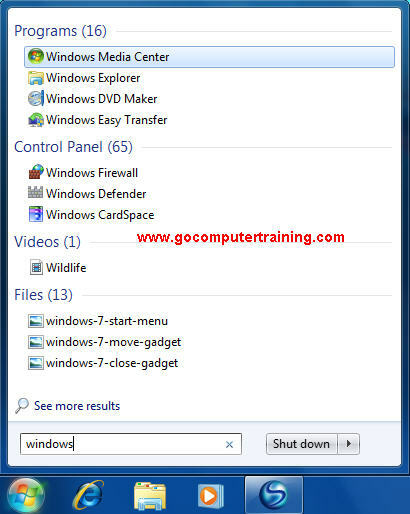 The right column of the Start menu provides easy access to folders, games, control panel, devices and printers, help, and shut down functionality. The top right side of the Start menu indicates who is currently using the computer (displayed the name). The bottom of the start menu contain instant search box, which allows you to search the Start menu to find programs and other Windows items, such as Internet favorites, history, files, contacts, e-mail messages, and so on.